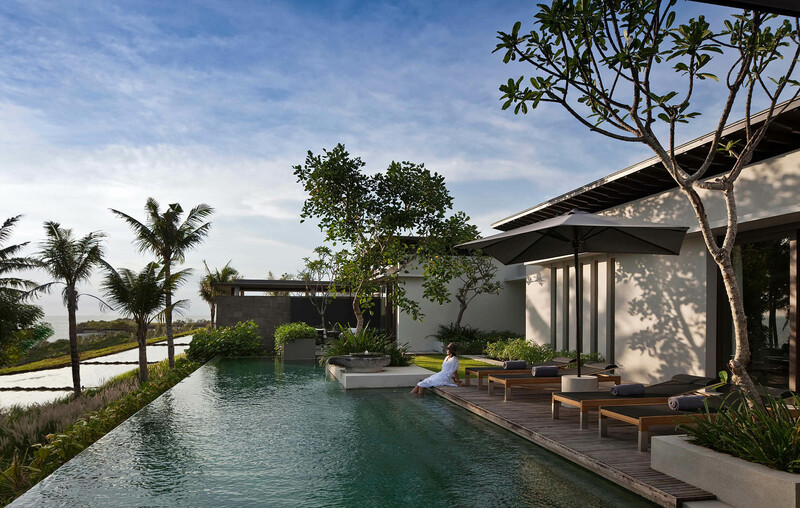 Nestled between a sweeping black sand beach and verdant rice paddies, the Soori Six-Bedroom Residence is an elegant haven on Bali’s southwest coast. 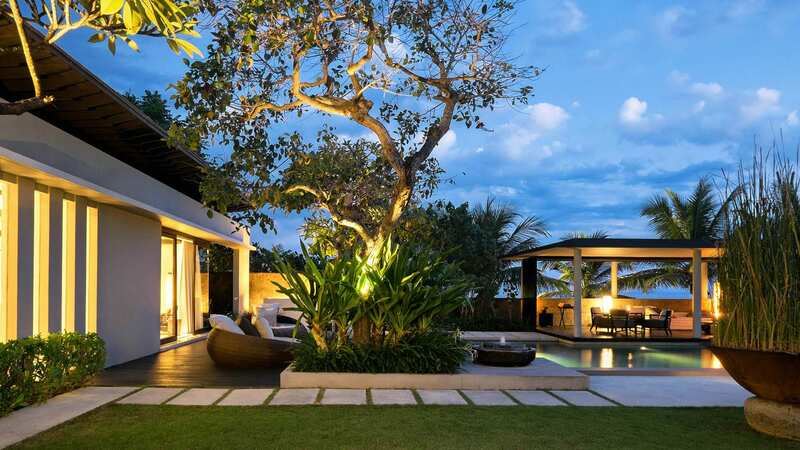 The villa is part of the sprawling Soori Bali resort, yet offers the utmost privacy for families and groups. 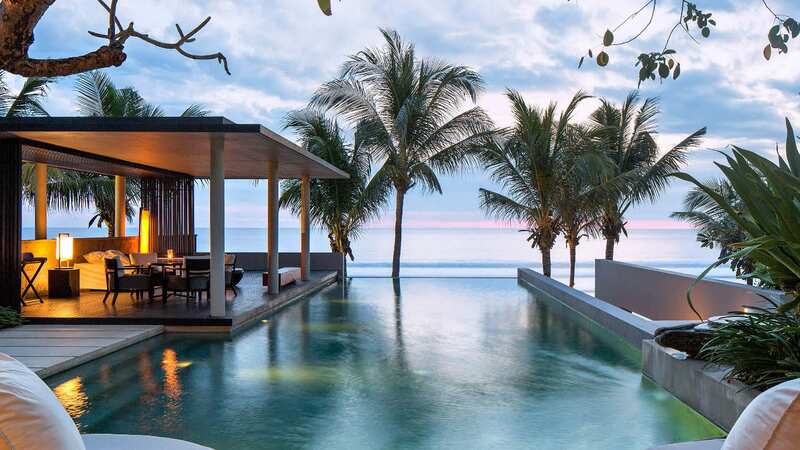 Guests will find plenty of space to spread out here, as the villa features gorgeous outdoor decks and dining areas, a glittering infinity pool just steps from the Indian Ocean, six amply appointed bedrooms with luxe amenities, and a private gym and spa therapy room. 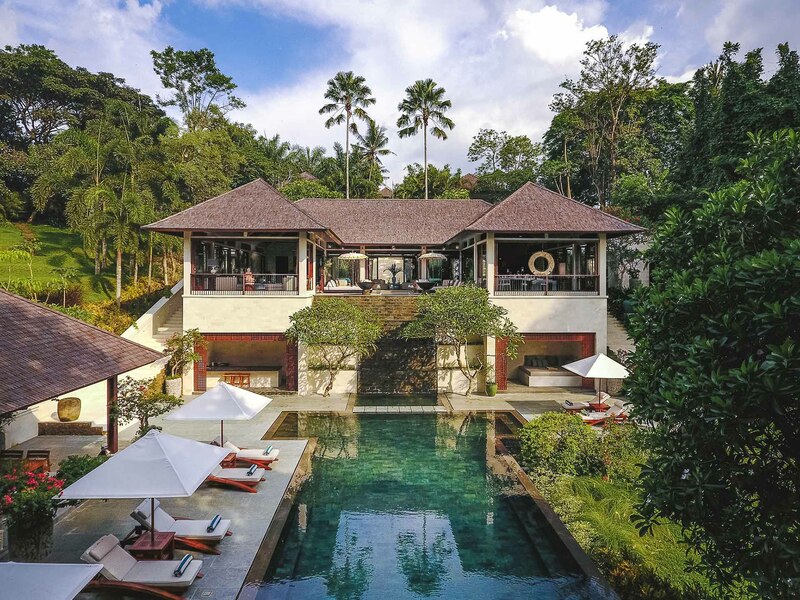 The Soori Six-Bedroom Residence was designed by renowned architect Soo K. Chan, who worked meticulously to ensure the villa flows seamlessly with natural surroundings. 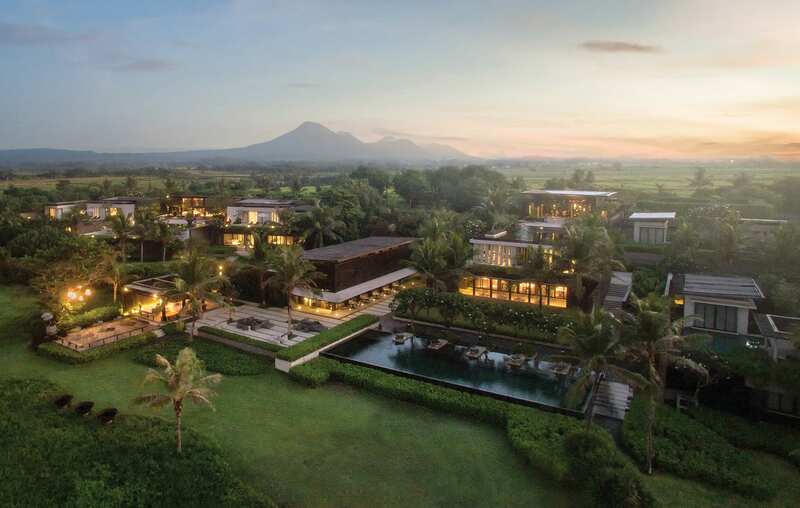 Minimalist features like floor-to-ceiling glass doors and clean white lines allow you to focus fully on the ocean and lush garden views, and native materials like dark wood and polished stone place you firmly in Bali. 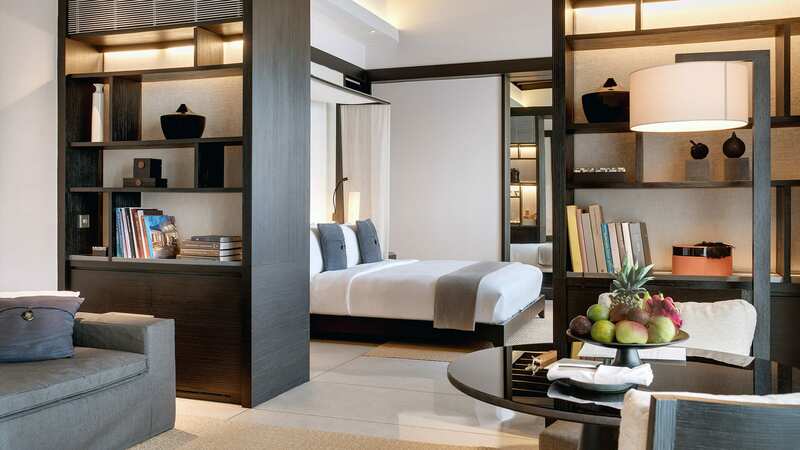 Modern touches like a gourmet kitchen, Bose Hi-Fi System, and Apple TV provide comfort and convenience, and should you want for anything else, the private butler and professional staff are on hand around the clock to attend to your every need. 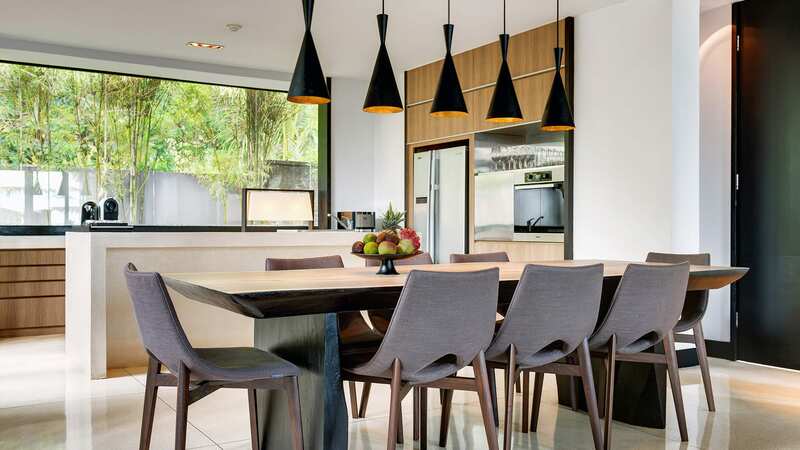 The living and dining areas offer ample space for guests to gather on the soft white sofas and at the lengthy wooden dining table next to the kitchen. 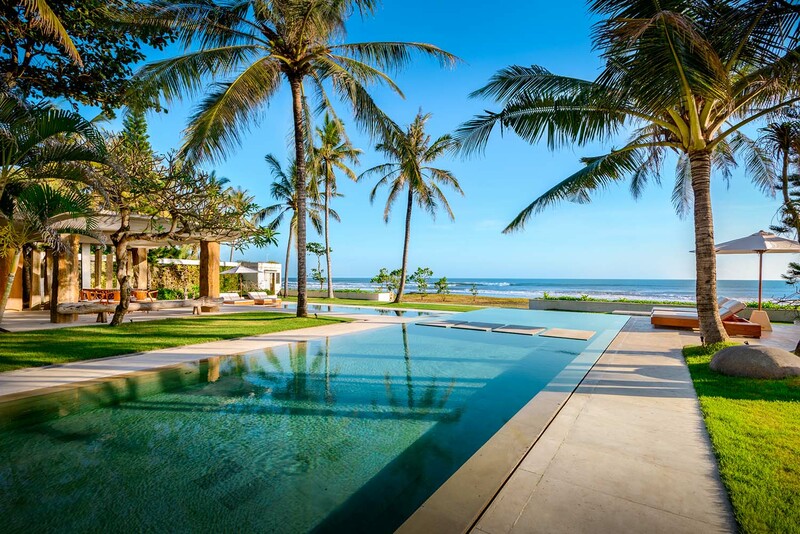 Huge glass doors can be opened to let warm sea breezes waft in and they provide access to the infinity pool, sundeck, and gardens. For those who want to work up a sweat, the gym has a good selection of cardio and strength training equipment, and after your workout you can indulge in some pampering in the spa therapy room. 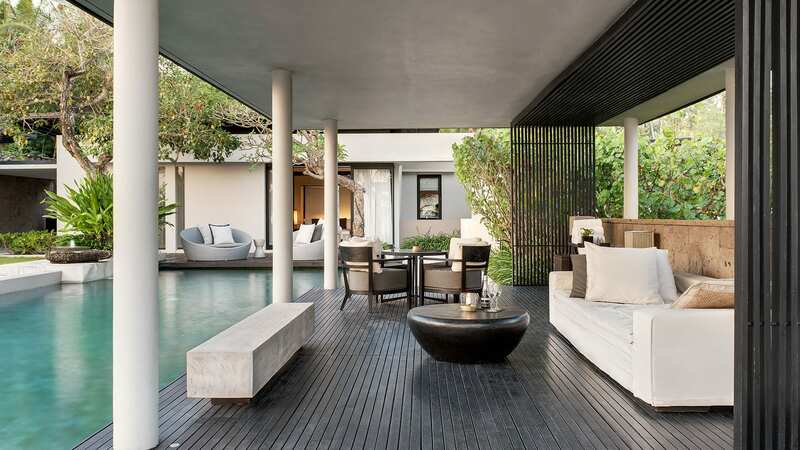 The Soori Six-Bedroom Residence’s roomy master suite offers unobstructed views of the Indian Ocean from the serene sitting area and the sleeping area with a plush king-sized bed. This suite also has a large walk-in closet and a gorgeous ensuite bathroom with a massive terrazzo bathtub. 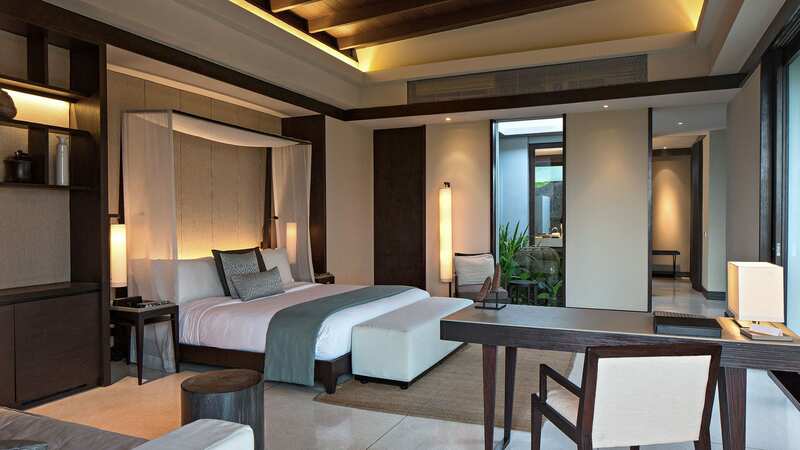 And like all suites at the villa, there are plenty of modern conveniences including a 55-inch LCD TV, complimentary Wi-Fi, and a mini-fridge. The five remaining suites here are spread out over two levels and include two with king-sized beds and three with twin beds. One king room and one twin room have bathrooms with ample-sized bathtubs, while the others have rain showers. No matter which guest suite you opt for, you will be treated to stunning ocean views and extra touches like luxurious Soori bath products. 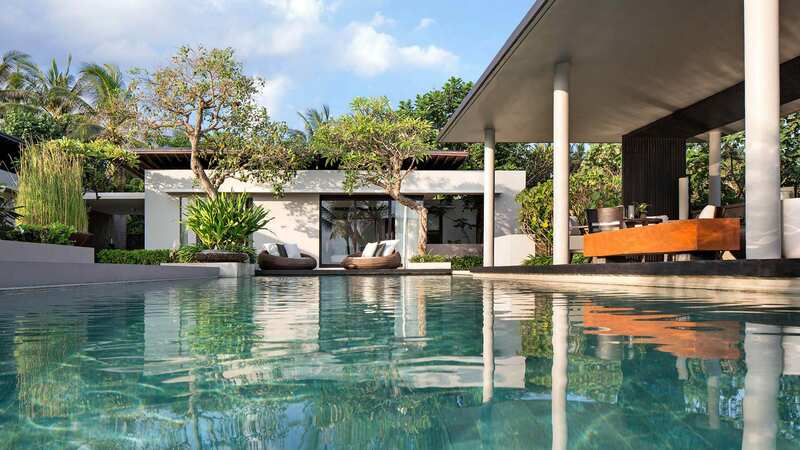 At the front of Soori Residence just steps from the sand is a beautiful 18-metre infinity pool surrounded by a wooden deck with circular daybeds. 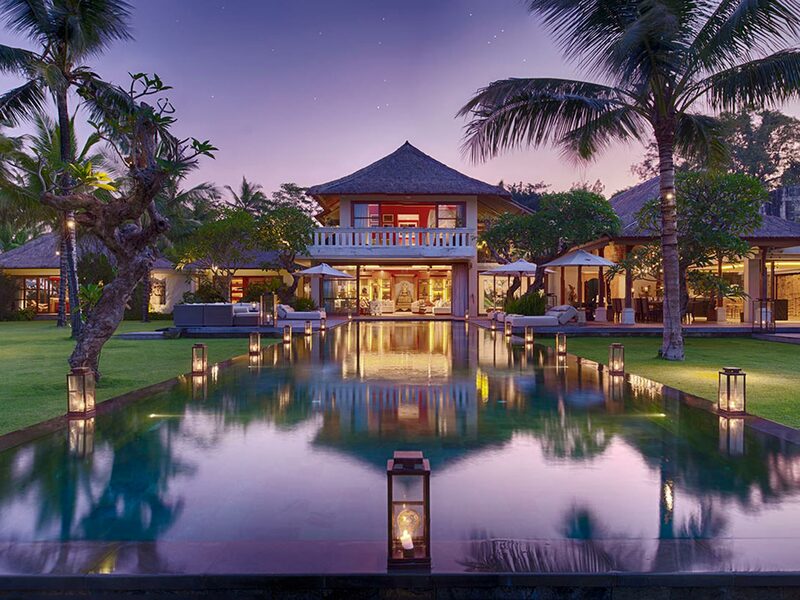 To one side of the pool is a covered outdoor dining pavilion that faces west, making it the ideal spot for cocktails and canapés come sunset. 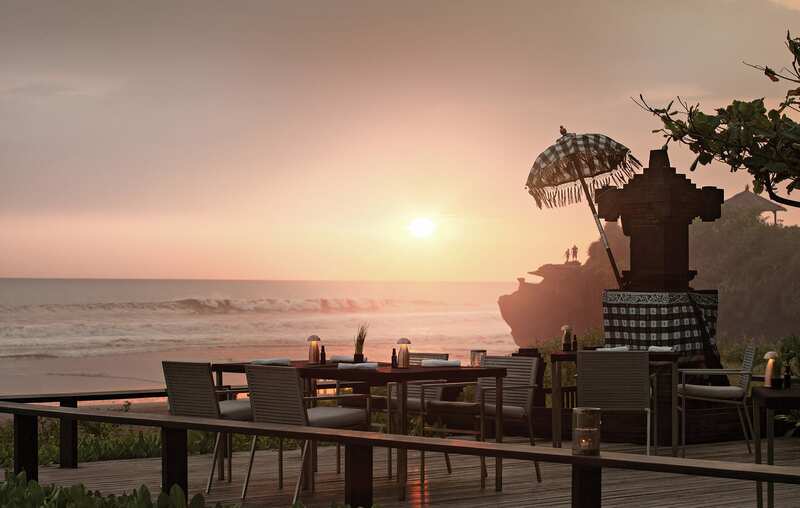 The villas also has an outdoor bar and BBQ, plus stunning manicured grounds awash in tropical flora. CAPACITY 12 Guests. 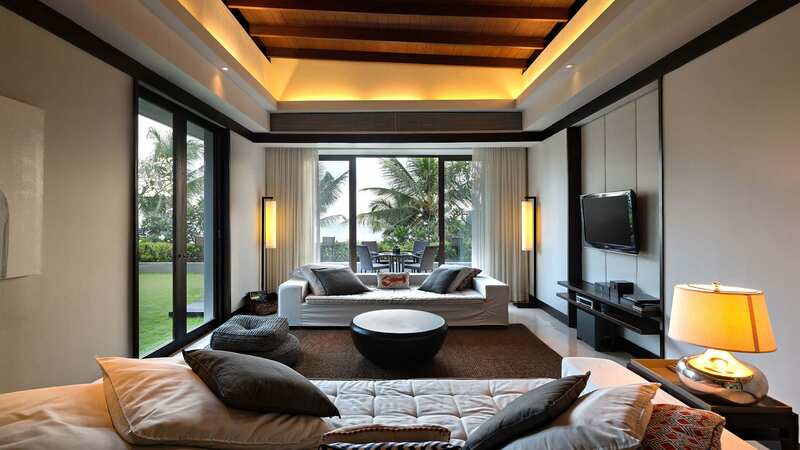 Six en-suite bedrooms spread over two levels. 4 king-size beds and 2 twin beds. 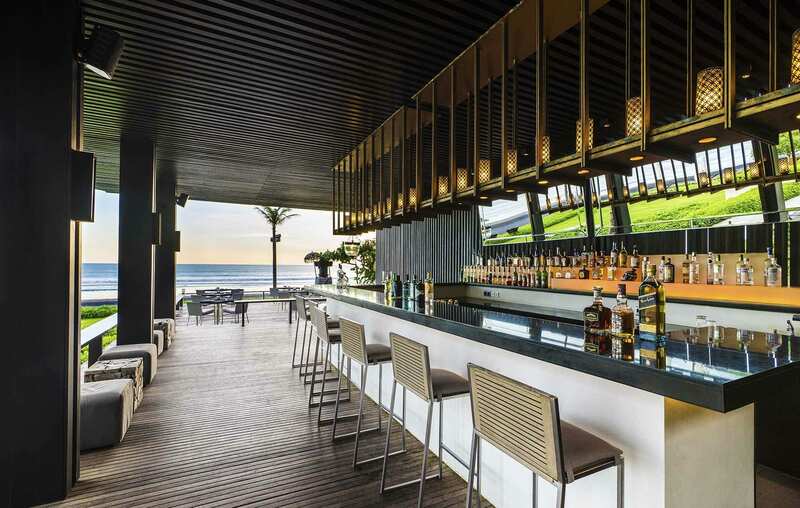 LIVING AREAS Several large outdoor decks, pavilions and lawns with barbecue and bar facilities create a perfect backdrop for open-air entertaining. 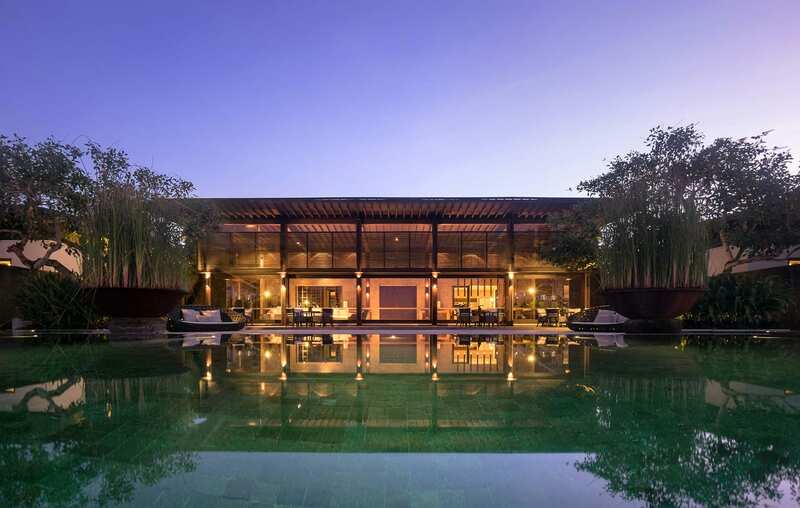 Complete with an infinity pool, gourmet kitchen, private gym and spa therapy room. ENTERTAINMENT 55-inch LCD TV, Apple TV upon request, BOSE Hi-Fi system, Music streaming player. 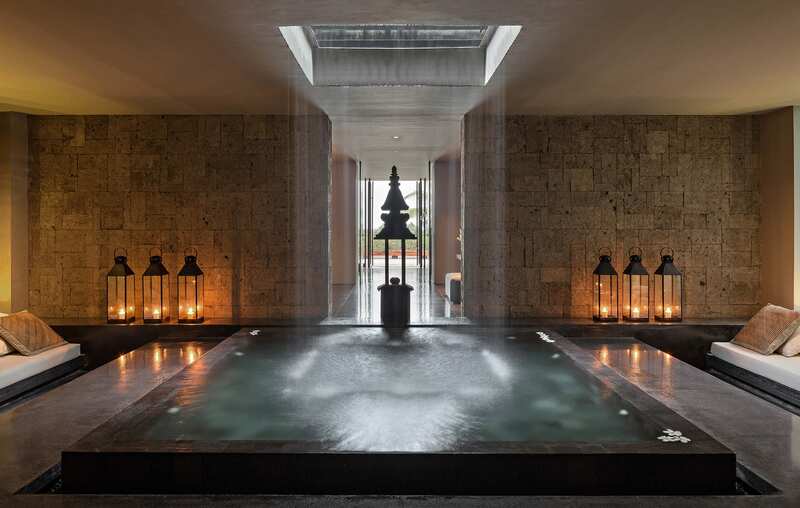 SPA Private Spa Room plus Soori Estate Spa - holistic & wellbeing treatments. PROPERTY AREA 1,350m2 / 14,532 sq. ft.